This fall, General Mills introduced four Fiber One Toaster Pastries: Strawberry, Blueberry, Chocolate Fudge and Brown Sugar Cinnamon. The company was kind enough to send a box of the Strawberry variety to our office. According to the box, Fiber One Toaster Pastries contain "the fiber you love to TASTE! 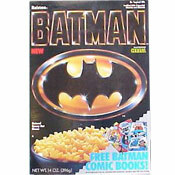 Sure you want fiber, but you want it to taste great! Each Fiber One Toaster Pastry contains 20% of the Daily Value of fiber and at least 16 grams of whole grain." Given these claims, I wanted to see if these pastries actually did taste great... and how they stacked up nutritionally to the toaster pastry leader, Kellogg's Pop-Tarts. Do they taste great? Yes. There seems to be a touch more strawberry filling than you find in similar products and that filling had more of a natural jam flavor. The amount of icing is comparable to other toaster pastries. The icing doesn't have a distinct flavor, but it does add a nice contract to the whole grain pastry. The actual pastry portion of this pastry has a definite wheat-like flavor. They don't try to disguise it. In the broader world of breakfast, these pastries reminded me of having a healthy, earthy, whole grain pancake with very sweet strawberry syrup. If I had a box of Kellogg's Strawberry Pop-Tarts and a box of these in my cupboard, I don't think I'd favor one over the other... in terms of taste... but what about nutrition? For a nutritional comparison, it seemed only fair to compare these to Kellogg's Whole Grain With Fiber Strawberry Pop-Tarts. It turns out that Fiber One Strawberry Toaster Pastries have 10 fewer calories per 1 pastry serving, 15 fewer calories from fat, 1 less gram of total fat, 0.5 grams less saturated fat, the same amount of dietary fiber, the same amount of sugar and 2 additional grams of protein. While the comparison isn't particularly dramatic, Fiber One Toaster Pastries win. So here's the bottom line: These toaster pastries taste just as good if not better than the nation's leading fiber-enriched strawberry toaster pastry and they're just a little bit better for you. If you like Pop-Tarts, you should give these a chance. 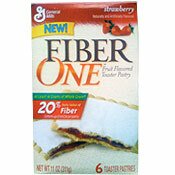 What do you think of Fiber One Toaster Pastries - Strawberry? The cinnamon sugar version is too sweet. The crust and icing were great, better than Pop-Tarts, but the syrupy stuff was too sweet. I bought all four flavors of these when they were on sale and so far have only tried the Brown Sugar flavor. I was very disappointed. Like most of the new Fiber One products, these have a cardboard texture and an odd taste. I think I've been spoiled because I usually buy a brand of toaster pastry that is far more delicious. I absolutely LOVE the Nature's Path line of organic toaster tarts, especially their brown sugar cinnamon flavor. With all natural ingredients, the flavor is superb and the fillings are plentiful. So why did I even bother to buy the Fiber One tarts instead of Nature's Path? Because they're a lot cheaper. But you get what you pay for. I like the taste of these. I do wish they made the strawberry ones pretty like the pop tarts w/the sprinkles though, I sort of miss that "fun" part of it. The dough/pastry part tastes a bit more fresher than pop tarts. =) Can't beat the variety of pop tarts flavors though! I've tried the cinnamon sugar ones; excellent. I'm afraid to try the chocolate fudge though because I suspect I would like it too much. Poptarts are a treat for me, so I'm not going to waste it with plain strawberry flavoring! Please Fiber One if you are reading this... Make Apple tarts. These are good. I like them. Can I get conples for fiber one pop tarts? I totally love these - the Chocolate Fudge flavor is the best though.